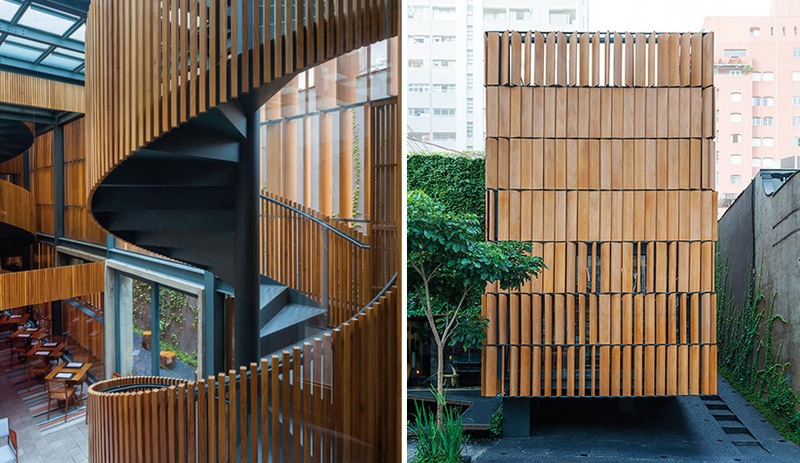 Left: Two spiral staircases, clad in strips of freijó wood, connect the restaurant with the studio above. The joint spaces share a lobby, and a rooftop covered in skylights. Right: The building is clad in lightweight, movable fins that diffuse light. 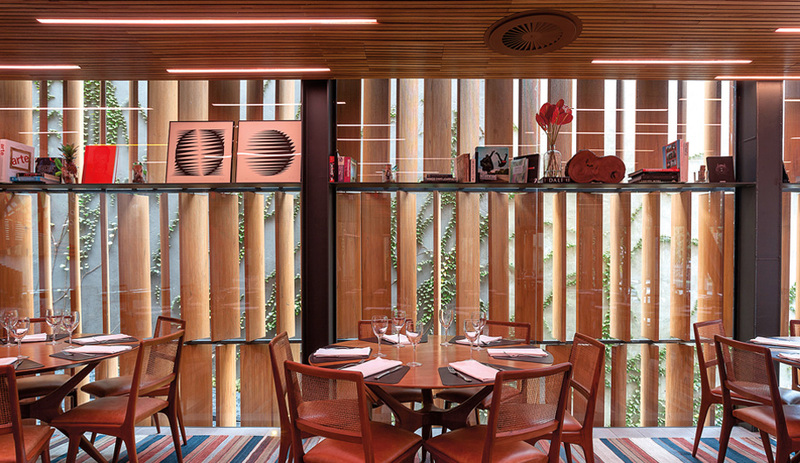 Earlier this year, Bossa opened in the heart of São Paulo, helmed by on-the-rise chef William Ribeiro, who serves up bossa nova cuisine, which mixes foreign influences with such traditional foods as mocotó and bean-based feijoada. What’s also new is the addition of an upstairs recording studio that joins two disparate businesses in one building. 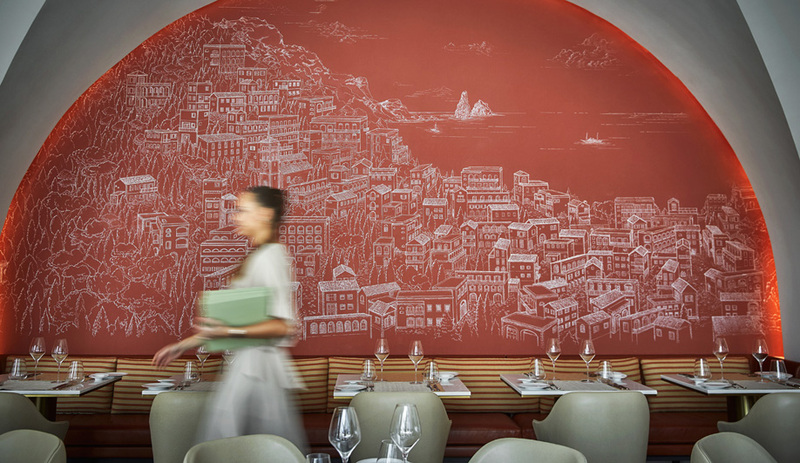 The restaurant’s furnishings are by such modernist legends as Giuseppe Scarpinelli and Sergio Rodrigues. 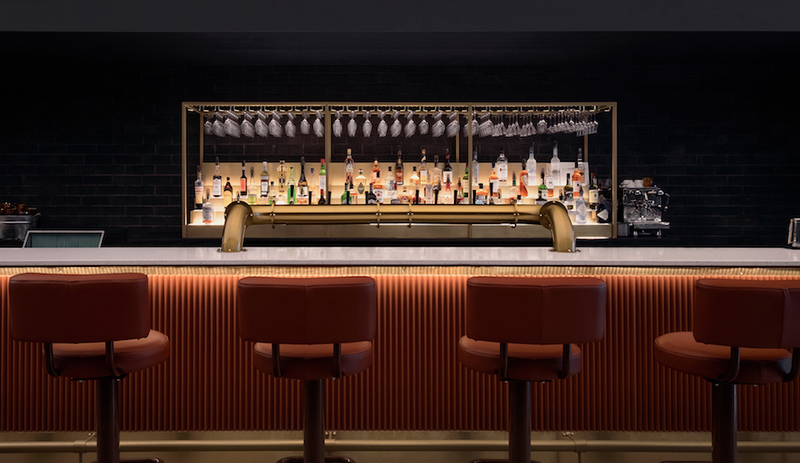 Local architect Marcelo Rosenbaum established the general organization of both spaces, including the glazed box of the studio, which overlooks a double-height lobby topped by a roof full of skylights. But many of the most eye-catching effects are by Rio de Janeiro multimedia artist Muti Randolph, widely known as a music club lighting expert. He designed the sleek, narrow volume to cantilever slightly at the front, and extend to the back by 35 metres. As its name suggests, Bossa is influenced by Brazil’s rich musical history and architecture, especially from the 1950s and ’60s. 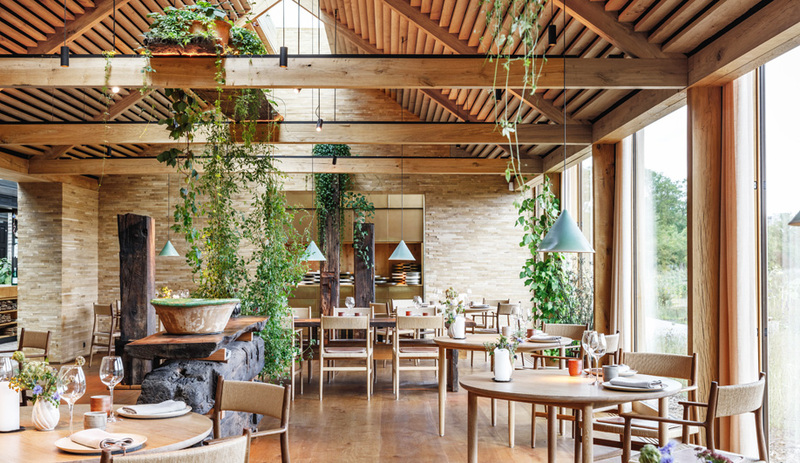 In the restaurant, grey encaustic cement tiles clad the intimate space, with furnishings by such modernist legends as Giuseppe Scarpinelli and Sergio Rodrigues. 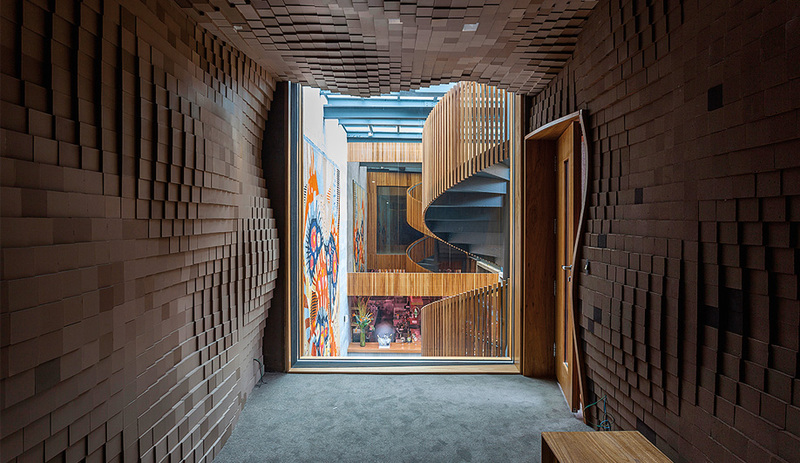 Slats of freijó wood define the rhythmic striped balustrades of two spiral staircases, while LED tubes embedded in the ceiling resemble anime speed lines. The space is doused with colour, via North African kilim carpets, and a vibrant wall tapestry by Rubem Dario. Externally, bamboo-like fins that pivot manually around metal tubes cover the entire building. A mix of powdered polymer and wood waste made by Lesco, they form an effective, and beautiful, brise-soleil. In the recording studio, sound-­buffering foam cubes form an undulating pattern, intended to mimic the rhythm of sound waves. In his other job, Randolph shapes dance clubs through a mesmerizing audio mix, synced to millions of shifting hues. He found an opportunity to express those fleeting forms at Bossa, too. In the control and recording areas, the walls are stacked with acoustical foam cubes, mounted in an undulating pattern that swells into the room over a grid of CNC-milled MDF sheets. “Visually, this texture relates to the sound waves, and it works well acoustically,” says Randolph. “I followed instructions from the sound engineer, but he had never worked with anything quite like it before.” To give the pixellated wall even more presence, they are painted in five shades, a visual trick that gives the intimate spaces depth and drama.